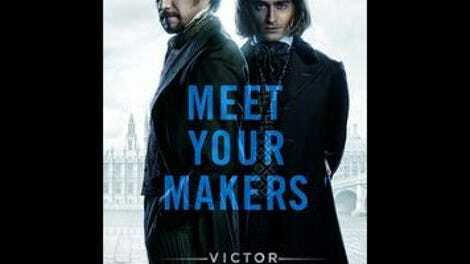 The first words spoken in Victor Frankenstein are “You know the story,” and anyone who simply mutters “Yep,” gets up, and heads back to the box office for a refund will be well ahead of the game. Written by Max Landis (Chronicle, American Ultra) and directed by Paul McGuigan (Lucky Number Slevin—yes, that was an actual title for an actual movie), the film purports to be one of those revisionist takes that views a literary classic from a new perspective. This concept goes back at least as far as John Gardner’s 1971 novel Grendel; recent Hollywood examples include Maleficent and Oz The Great And Powerful. Here, we ostensibly get Frankenstein as seen through Igor’s eyes (it’s not called Igor, presumably, because an animated movie got there first), in a version of the story that doesn’t even depict the creation of the monster until the final sequence. There is no character named Igor in Mary Shelley’s novel, however, nor does Victor Frankenstein have any sort of lab assistant, hunchbacked or otherwise. So Landis has only the representation from earlier movies to riff on, along with his imagination. They don’t add up to very much. For one thing, Landis apparently assumed that nobody actually wants to sit through an entire movie about a demented, deformed lackey. Consequently, he reconceives Igor (Daniel Radcliffe) as a brilliant autodidact who works as a clown/freak in the circus but spends his off hours obsessively studying human anatomy. When the object of his affection, trapeze artist Lorelei (Jessica Brown Findlay), falls during a performance and is gravely injured, passing spectator Dr. Victor Frankenstein (James McAvoy) rushes to her aid, but can do nothing; it’s Igor who knows how to get her breathing again. Impressed, Frankenstein frees Igor from his involuntary servitude and makes him a partner—not an assistant—in his experiments to reanimate dead tissue. He also immediately drains the enormous abscess that was Igor’s “hump” and puts him in a back brace, transforming him from a sorry, stooped wreck into… well, into Harry Potter, more or less, except with magic derived exclusively from lazy screenwriting. (A single glance at a patient in a hospital bed inspires a long list of medicines she needs, that sort of nonsense.) Their work goes slowly, though, and the movie’s primary antagonist is not the legendary monster but a very ordinary police inspector (Andrew Scott) who believes Frankenstein killed a man helping Igor escape the circus. Sound exciting? As it happens, Inspector Turpin is the most inventive and entertaining part of Victor Frankenstein, despite the character’s dull functionality (he also represents Faith in opposition to the heroes’ Science); Scott’s almost robotically intense performance provides the film with occasional jolts of electricity during the long, long wait for the lightning bolt that brings the big guy to life in the climax. McAvoy plays the title character as if he’s hoping he’ll become Robert Downey Jr. and this movie will launch an equivalent to Guy Ritchie’s Sherlock Holmes franchise (ground is carefully laid for a possible sequel). 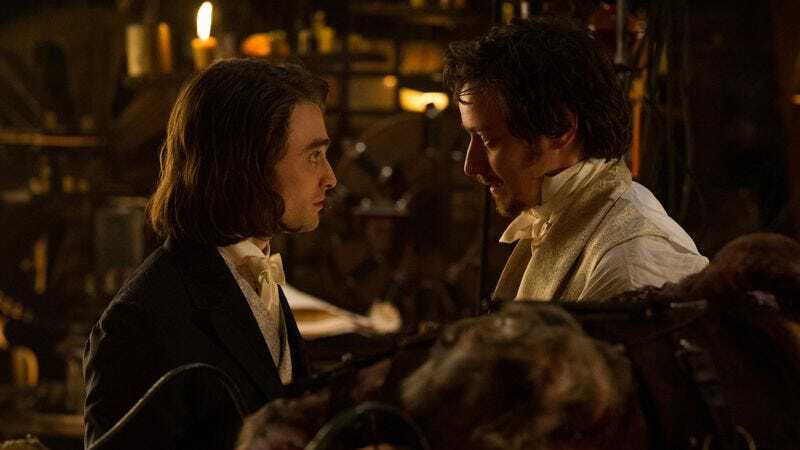 Radcliffe can’t really do much of anything with his blandly likable version of Igor, who spends most of the movie either throwing switches (i.e., the character’s usual job) or weakly protesting Frankenstein’s lack of professional ethics. An early sequence involving a prototype for the monster, fashioned primarily from a chimpanzee, sees McGuigan generate some visual excitement, but Landis spoils even this by throwing in a cutesy in-joke directed at Comic-Con attendees, with someone repeatedly announcing that Frankenstein will be holding a “big presentation in Hall H!” And if there’s a more uselessly decorative female lead in a 2015 movie than the personality-free Lorelei… well, that would be depressing. How about some revisionist takes in which women have thoughts and agency? Too out there?